$10 Late Fee after 8pm Friday August 12. Registration will be available online and onsite Saturday and Sunday: $60 College Students, $70 Individual, $105 Relay. The Bradley University Tri Club & Bushwhacker are bringing the excitement of a downtown triathlon to Central Illinois. Come experience Downtown Peoria like never before. 2015’s race was an overwhelming success and we are ready to bring you more. Yes, the River is clean. We’ve done our homework, worked with the city, and look forward to providing a safe, fun, sprint distance race. 3.1 mile (5K) paved Riverfront Trail Run. 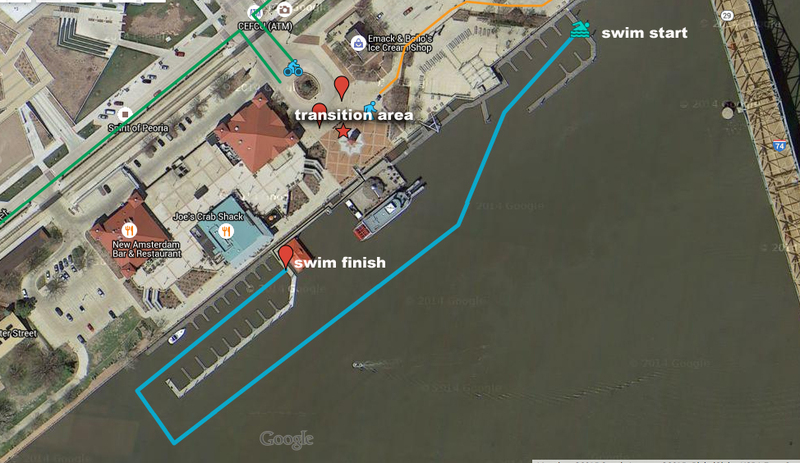 Transition area will be at the Spirit of Peoria Landing/Riverfront Village. Registration limited to 300 participants. Registration closes Sunday August 20 @ 715 am. All participants will receive race t-shirts, and will be chip-timed. Awards will be presented to the top overall male and female, top male and female in each age group, and top 3 relay. Age groups will be split into 5 year groups 0-19, 20-24, 25-29, 30-34, 35-39, 40-45, 46-49, 50-54, 55-59, 60+. All proceeds from this event will be donated to the Central Park Pool in Peoria. The Central Park Pool lost funding during Peoria Park District’s budget cuts. The Peoria Area Water Wizards, a local swim club, took on the project and has been looking for financial support for this great resource. On race day be sure to thank the volunteers representing these groups. Thank you in advance for your support. Sunday 6:00-7:30 a.m. Race Day packet pickup downtown near transition. Relay teams will start based on the swimmer’s age group and gender. Race officials along with local safety officials will make the decision to modify or cancel the event. Entry Fees: Event fees will not be refunded. The funds collected will be used to develop and coordinate this event. Individual reimbursement will not be possible and the decision to allow entry into future events will be decided if/when these events are held. Event may be cancelled due to extreme weather or other emergency. Delaying the event is unlikely due to the time demand of public officials for closing local roadways. Please click for the tentative layout: Click Here for Layout. The swim is in light green, the bike in blue, and the run in orange. The course is subject to change due to road closure restraints. Bike Course: 2 laps on Washington, First lap includes lolli-pop ride up Main street. CYCLISTS: The course route is up Main Street, Left on Sheridan, Left on High, Right on Main Street, Right on Washington. Once on Washington you will ride two out and back laps on Washington. Run Course: Final Course may be modified slightly from this map. THE RUN COURSE HAS CHANGED. The course will be 3.1 miles including the loop at the north end of the trail. Volunteers will be on course to direct you along the way. Water stops at mile 1 and 2. Wet Suits: wet suits will be allowed. The race will not adhere to wetsuit restrictions due to temperature. Use caution as it is likely the water temperature will be above 78 degrees the morning of the event. Bill – this race is not USAT sanctioned. It is designed to be a sprint only race and we will work towards a sanctioned race if the need is there next season. Your website states individual registration is $60, but when I attempt to register, it’s $70. The website doesn’t indicate a price increase that I can see. I apologize for the confusion. Initially the timing company and I decided to have a price tier increase. I decided against it shortly after our discussion and the registration site should reflect that pricing now. Thank you. Awards age groups have been added to the Race Info page. Dan – I appreciate the feedback. This is the first year of our event and we are focused on raising money for our local pool. If the event grows large enough to support more awards we will consider them in the future. I added two team members’ names, birth dates and shirt sizes when registering. None of that information appeared on the receipt. I then sent a request for both to join the team and it now is asking for the same information from them that I already entered. How do I go about verifying that the team was indeed registered correctly and that all the information including t-shirt sizes was received? david – what is your team’s name? Are the monies being raised to help support central park pool? Yes – All money raised through this event will be split between The Bradley Triathlon Club and support for Central Pool. What is the water temperature today? Is there somewhere we can check on this daily? Water temp was 76 last night at 6 pm. I will update it as often as I can, but will not be able to do it everyday. the course was updated. There have been two things slightly altered. THANKS GUYS HAD A GREAT TIME!!!! Even though my bike tire popped I pushed through and had a great race!! See you next year. I was wondering if you know when the 3016 TriAthlon will be? I had so much fun at this one that I want to make sure to get the 2016 on my calendar! looks like august 21 or 28 for 2016, waiting on final approval from the city. Would this be considered a beginner friendly event? Looks at the past times, seems to be pretty top heavy. Matt – absolutely this race is great for beginners. We had slightly under 200 participate last year. It is a very wide field, plenty of beginners, a few faster athletes, and most of us left somewhere in the middle. It is definitely beginner friendly, spectators can see you at multiple points along the course. Hello. Is it possible to participate both in a relay and as an individual? Do the swim leg as a relay team member and then hand of the relay chip and then continue as an individual on a bike with individual chip? Absolutely! We had a number of teams do it that way last year. You’re team will be responsible for transferring the proper timing chip during the race. The swimmer will wear two chips, one for individual placement and one for the team during the swim. Awesome! Do I need to register for both relay and individual? And specify it somewhere? yes – you will have to register as an individual and also as team captain or team member. As long as your team gets registered you can always add member as needed. I can help out if you run into any hurdles. I know the policy says no refunds, it I signed up today before I was told of a prior obligation that was scheduled with family. Is there any exception to the rule? Thanks for the Great 2016 race! I was part of a team this year and we enjoyed it. My partner that did the swim and a few other friends that did the full course commented on the difficulty of the end of the swim where it was required to swim up-current. The competitive swimmers probably didn’t have much of problem, but the slower beginner swimmers struggled to make headway and felt like they were either making no progress or having to swim too hard and risked exhaustion and not completing the swim. I enjoyed the slightly changed bike course this year as well. Thanks again for putting on a great race and just something to keep in mind for next year! First – I am glad you enjoyed the race. It is one of my favorite events of the year. Second – I have received some feedback about a stronger current towards the end of the swim. The longer swim course was a goal of ours for this year and we are hearing both positive and negative reviews. Going forward I will definitely take this feedback and try to work towards an alternative. The course should provide a challenge, but it should not become unsafe. A heads up: The 2017 date is incorrect. It says Sunday the 21st. And that Sunday is the 20th. Will there be any swimming buoys to help sight? There will be plenty to help sight from. The docks will be to swimmer’s right side, and large buoys will be located at the turns.